Originally designed by Stan Lee and Bill Everett, with a billy club holster. Also in issues #3 and #4, there was a hood on the back, to hold street clothes, but it was torn and removed from the costume. (Thanks to Joel Poirier for this info!). Early issues had one 'D' on chest, then 'DD' later on. 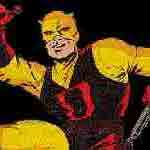 Daredevil Yellow, the mini-series, revealed that the original material of the costume was made of Jack Murdock's boxing robe. 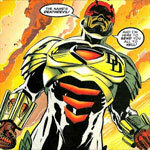 This costume lasted until issue #6, although it made a reappearance when Matt/Jack Batlin was having an identity crisis. 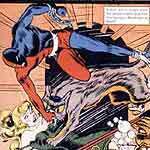 Wally Wood created this costume that most people know well. This costume also had a billy club holster. 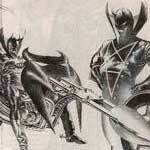 In early issues, it was shown that the horns on the costume were antennae that could pick up radiowaves. His billy club was also shown to have a retractable microphone, a minature tape recorder, wire cable, and a chamber for projectiles. 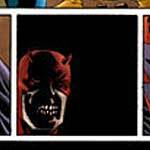 Daredevil wore this costume from issues #7 until the Fall From Grace issues by Chichester and McDaniel. Designed by D.G.Chichester and Scott McDaniel, this costume had armour and billy clubs that attached to his forearm. The two clubs could be attached together to form a staff. 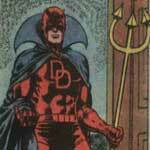 This costume lasted until issue #344, where DD went back to his red costume, after this costume was torn to shreds. This was the costume DD wore when he was undercover as Laurent Levasseur in France. 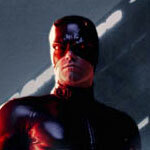 He was unaware that he was Daredevil/Matt Murdock. 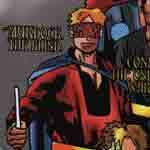 A billy club holster was on his chest, rather than his leg like his red costume. To help in his battle against the Santerians, DD donned this costume, complete with motorbike. From the SHADOWLAND event in 2011, DD wore this costume as he led the Hand and fell under the influence of the Beast. Making its debut in DAREDEVIL V4 #14, Matt decided a change was needed in his new home of San Francisco. 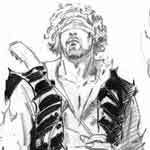 Check out my SKETCHES section for a look of some of the designs Scott McDaniel did back in '93 for DD's new costume. 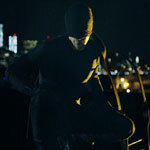 The Daredevil movie costume was designed by James Acheson, the same man who made the Spider-Man movie costume. 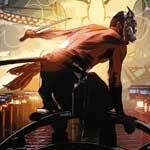 Warren Manser helped with concept illustrations. It is a full leather outfit, with billy club holster on the right leg. This DD costume appeared in What If? Vol. 2 #83. 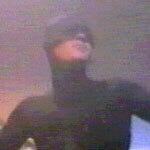 This TV movie version of Daredevil was played by Rex Smith. More details in the MOVIE section. Thanks to Alan Wright for sending me the jpg. This is from the first What If? series where DD is an Agent of SHIELD. On the cover DD is wearing a yellow costume, but in the story he has a black costume. Thanks to Brad Lemon and Terry Collier for the scan. 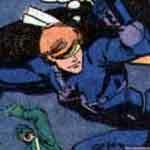 This version of DD appears in the Timeslip:The Coming of the Avengers one-shot. DD is referred to as 'Murdock the Blind'. 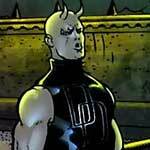 Darkdevil made his first appearance in Spider-Girl #2 in the MC2 universe. He had his own limited series as well. Thanks Mike Kaiser for the scan. 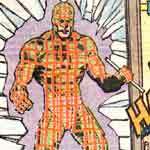 Sale's sketch was part of Marvel Vision's Timeslip feature where creators got the chance to 'design' the character for the first time. 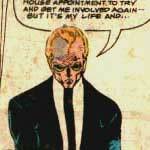 This appeared in Marvel Vision #5 and the recently printed Timeslip Collection. Ross' sketch first appeared in a special insert in Wizard #77 called Earth-X, similar to Kingdom Come, but with Marvel characters. 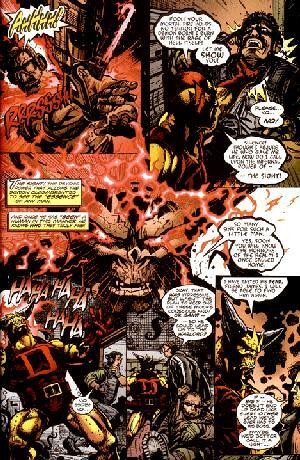 This version of DD has a major role in the Earth X series as part of Steve Rogers' force against the Skull. 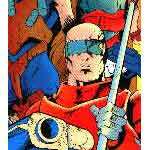 Referred to as M. Murdock, this version of Daredevil appeared in X-Universe #1-2, a story about the other non-mutant heroes during the Age of Apocalypse storyline. 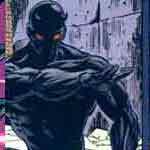 This costume appeared in 2099 AD Genesis #1. Thanks to Brad Lemon for the scan. This version of DD appeared in a special 5th week event called Marvels Comics, where tales are told of heroes where Marvel exists in the 'Marvel Universe'. This was where DD was made into a zombie by Calypso, in issue 311. 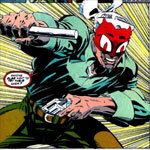 In the Man Without Fear limited series, Matt used this as a 'costume' to rescue Mickey. This is the version of DD from the Mutant X alternate reality. Thanks to Brad Lemon for the scan. 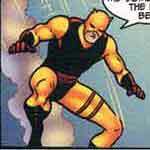 This version of DD appears in the FF Annual 2001 as part of the alternate dimension team 'The Law Enforcement Squad'. Thanks to Brad Lemon for the scan. 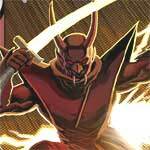 Let me introduce you to the version of Daredevil premiering in the first issue of Spider-Man: Legend of the Spider Clan with a couple of pics. The first is the original character designs by Skottie Young and the other is the cover for issue 2. 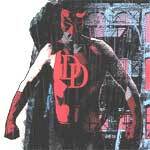 Please note that Matt Murdock is a different design than what you see here. 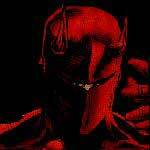 Who is this version of Daredevil? He's someone whose true love was taken away from him by dark and evil forces. He's been chasing these forces ever since, punishing himself for what happened and preventing the darkness from spreading in this world, at any cost. He's a pretty extreme character, both physically and emotionally. 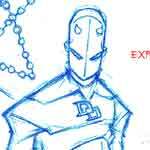 Many thanks to Kaare Andrews for this sneak peek of this version of DD! It was a common thing in Europe to publish US superheroes without copyright, hence "Neboysha" appeared in the 1970's, with a blue and yellow costume. Many thanks to Rogan for sending me this scan! 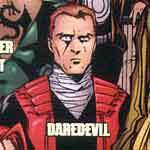 This was the version of Daredevil that appeared in the alternate universe of the Exiles, in issue #21. Thanks to Brad for the scan! 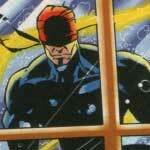 This is the version of Matt Murdock from the 1602 series. He is a street singer who is also a mercenary agent working for Sir Nicholas Fury. 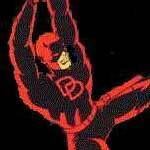 This is the original Daredevil published by Lev Gleason, who now goes by the name Red Devil, so not to get confused with the Marvel version. Thanks to StanCheck for the scan. 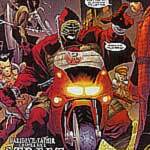 From the Amalgam universe comes Dare, who appeared in Assassins #1! Thanks to StanCheck for this and many of the following scans. 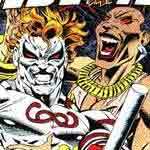 Also from the Amalgam universe comes this version of Daredevil and Deadman, from X-Patrol #1. From What If? 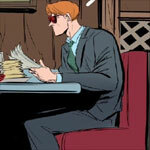 (I) #38 comes this alternate future with an older Matt Murdock! From What If? 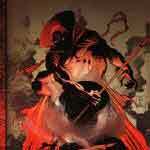 (I) #19, comes this version of DD that appears if Spider-Man never became a crime fighter. From What If? (II) #102, this version of DD comes to life when Matt's Dad fakes his fight in "Shadow Boxing". From What If? 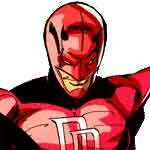 (II) #75, Daredevil fights in this costume to overcome being controlled by the Kingpin. From What If? 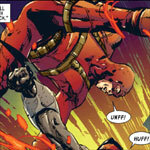 (I) #34, this humourous tale shows us what would happen if Daredevil could see. 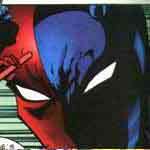 This comes from the issue that asks "What if no one watched the Watcher?". 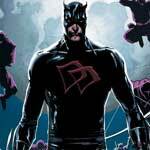 As part of a special series of books written by Robert Kirkman comes Marvel Knights 2099: Daredevil. Samuel Fisk carries on his shoulders the burden of a legacy that has lasted over 100 years. He struggles to balance his life with the duty he has accepted in order to continue the works of those that have come before him. 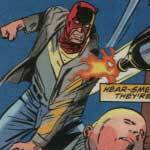 Samuel Fisk is Daredevil! 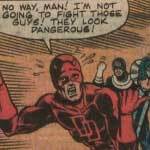 On their secret mission in Latveria, DD and the rest of the heroes wear alternate costumes. Thanks to Nick for the scan. 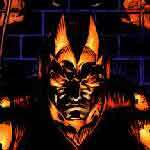 This version of DD appeared in Defenders V3 #4, in an alternate reality created by Dormammu. Thanks to "Gamart" for the scan. In this What If? story by Rick Veitch and Tommy Lee Edwards, DD's costume reflects the time period of the piece. 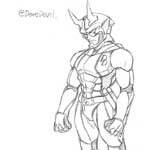 This preliminary sketch of the "New Mangaverse" previewed the series that came out in 2006. 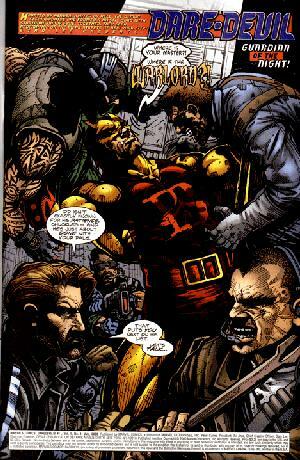 This "undead" version of DD made his first appearance in the alternate reality where the Ultimate Fantastic Four visited, and was seen again in the Marvel Zombies series. This spoof came from the pages of What If? 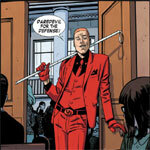 (II) #17... What if Daredevil had a dishonest tailor?!? Thanks to C. from Atomic Media for the scan. 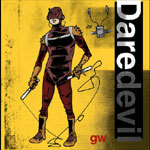 This version of Daredevil was part of the Noir line from Marvel, with Matt Murdock in the early 20th century. The limited series was written by Alex Irvine, with artwork by Tomm Coker. 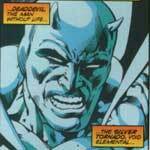 This version of Daredevil appears in the What If? 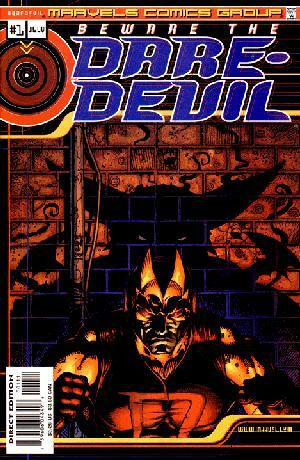 Daredevil was Resurrected by the Hand one shot. Elektra appears as a SHIELD agent. 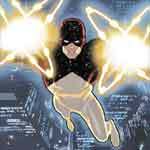 In this special one-shot in 2005, Captain Universe bonds with Daredevil, granting him cosmic powers! 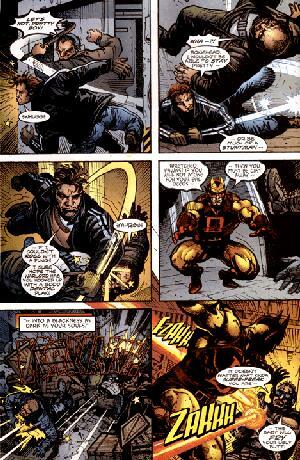 In the "Old Man Logan" storyline in WOLVERINE, this alternate future version of DD appeared, as he is held captive by this reality's version of Kingpin and meets his demise as a meal for some raptors. 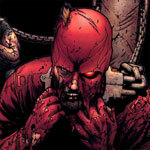 In this reality, Daredevil is a member of the "Avengers of the Undead". 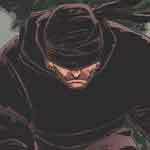 His first appearance was in SECRET AVENGERS #33. 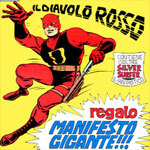 In 1970, the publishing house "Editoriale Corno", who owned the copyright to Marvel characters in Italy at the time, published Daredevil as "The Incredible Devil" and recoloured the first 7 issues with a red costume. Thanks to Nicola for the scan and the info! 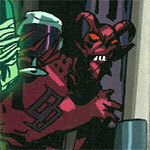 From issue #314, DD uses this disguise, but you have to wonder how he knew there was a devil pattern on it. 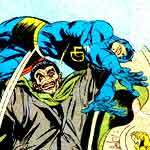 From issue #380, a criminal has a vastly exaggerated recollection of DD's powers. From this series by David Lapham, "Keeper Murdock" hunts mutants for Apocalypse. 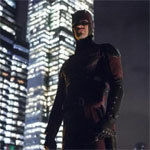 A first costume for Daredevil from the Netflix show, clearly inspired by the "costume" from DD: THE MAN WITHOUT FEAR. Another costume, seen in flashback, also inspired from DD: THE MAN WITHOUT FEAR. 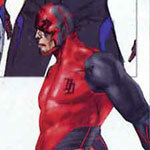 The red and black armoured costume from the show, designed and created by Melvin Potter for Daredevil. From EDGE OF SPIDER-VERSE #2, here's a Matt Murdock who works for the Kingpin in the Spider-Gwen universe. 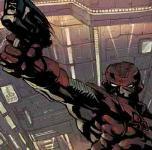 From EDGE OF SPIDER-VERSE #5, here's Daredevil who teams up with SP//dr.